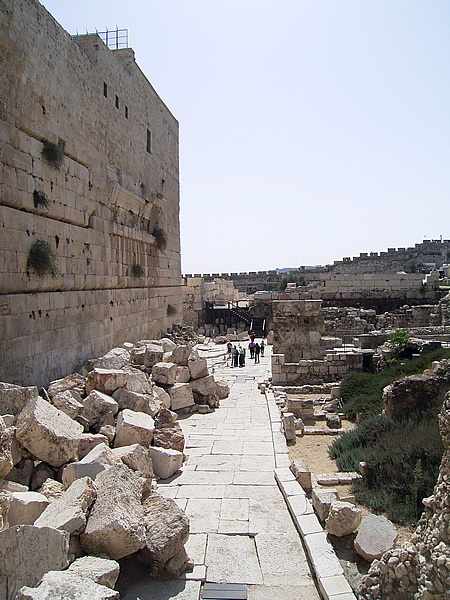 The temple: South-western wall, excavated to 70ce level, viewed facing south. The large stones are from the temple, laying where they were thrown down during the destruction of the temple after 70ce. The protruding ledges are the remains of what was once a stairway over the concourse, leading up onto the temple concourse above. Close to the foot of the stairway but out of the picture to the right are the remains of ablution blocks for ritual cleansing. GO HERE for a tour of Jerusalem c66ce. Explanations for this silence have of course been attempted. Yet the simplest explanation of all, that perhaps ... there is extremely little in the New Testament later than ad 70 [Moule, op. cit., 121.] and that its events are not mentioned because they had not yet occurred, seems to me to demand more attention than it has received in critical circles. In fact this is too sweeping a statement, because the dominant consensus of scholarly opinion places Mark's gospel, if not before the beginning of the Jewish war, at any rate before the capture of the city. [Cf. the summary of opinions in V. Taylor, St Mark,21966, 31. He himself opts, with many others, for 65-70. Kummel, INT, 98, hedges his bets: 'Since no over-whelming argument for the years before or after 70 can be adduced, we must con-tent ourselves with saying that Mark was written ca. 70.] Indeed one of the arguments to be assessed is that which distinguishes between the evidence of Mark on the one hand and that of Matthew and Luke on the other. In what follows I shall start from the presumption of most contemporary scholars that Mark's version is the earliest and was used by Matthew and Luke. As will become clear [Cf. pp. 92-4 below. ], I am by no means satisfied with this as an overall explanation of the synoptic phenomena. I believe that one must be open to the possibility that at points Matthew or Luke may represent the earliest form of the common tradition, which Mark also alters for editorial reasons. I shall therefore concentrate on the differences between the versions without prejudging their priority or dependence. The relative order of the synoptic gospels is in any case of secondary importance for assessing their absolute relation to the events of 70. Whatever their sequence, all or any could have been written before or after the fall of Jerusalem. When he was sitting on the Mount of Olives facing the temple he was questioned privately by Peter, James, John, and Andrew. 'Tell us,' they said, 'when will this happen? What will be the sign when the fulfilment of all this is at hand?' (13.1-4). Even if, as most would suppose. [Josephus, BJ, 6. 300-9. In citing Josephus I have followed the notation and, unless otherwise indicated, the translation in the Loeb Classical Library.] the discourse represents the work of Christian prophecy reflecting upon the Old Testament and remembered sayings of Jesus in the light of the church's experiences, hopes and fears, the relevant question is, What experiences, hopes and fears ? But when you see 'the abomination of desolation' usurping a place which is not his (let the reader understand), then those who are inJudaea must take to the hills. If a man is on the roof, he must not come down into the house to fetch anything out; if in the field, he must not turn back for his cloak. What apparently the instruction is shaped by (whether in the mind of Jesus or that of a Christian prophet speaking in his name) is, rather, the archetypal Jewish resistance to the desecration of the temple-sanctuary by an idolatrous image under Antiochus Epiphanes in 168-7 bc. It is more likely that the reference to 'the abomination of desolation standing where he ought not' (to stress Mark's deliberate lack of grammatical apposition) is, like Paul's reference to 'the lawless one' or 'the enemy' who 'even takes his seat in the temple of God' (II Thess.2.1-12), [There is here the same transition between neuter and masculine: τὸ κατέχον(v.6), ὁκατέχων(v. 7).] traditional apocalyptic imagery for the incarnation of evil which had to be interpreted ('let the reader understand'; cf. Rev. 13.18) according to whatever shape Satan might currently take. It is indeed highly likely that such speculation was revived, as many have argued [E.g. B. W. Bacon, The Gospel of Mark, New Haven, Conn., 1925, 53-68. ], by the proposal of the Emperor Gaius Caligula in 40 to set up his statue in the temple (which was averted only by his death). [Josephus, Ant. 18. 261-309. For the horror and alarm which this raised among Jews, cf. Philo, Leg. Ad Gaium, 184-348.] Paul was evidently still awaiting the fulfilment of such an expectation in 50-1 (to anticipate the date of II Thessalonians), where 'the restrainer' holding it back is probably to be interpreted as the Roman Empire embodied in its emperor (ὁ κατέχων being a play perhaps on the name Claudius, 'he who shuts'). His expulsion of the Jews from Rome in 49 could be reflected in the phrase of I Thess. 2.16 about retribution having overtaken them εἰς τἐλος ('with a view to the end'?). [A suggested interpretation I owe to Dr E. Bammel.] The only other datable incident to which 'the abomination' might conceivably refer in retrospect is the control of the temple not by the Romans but by the Zealots temporarily in 66 and permanently in 68, which Josephus speaks of in terms of its 'pollution'. [BJ 2.422-5; 4.147-92; 5.IQ. So M.-J. Lagrange, S. Matthieu, Paris 1927, 462; R. T. France, Jesus and the Old Testament, 1971, 227-39; W.J. Houston, New Testament Prophecy and Christian Tradition, unpublished D.Phil, thesis for the University of Oxford, 1973. Cf. F. F. Bruce, 'Josephus and Daniel,' ASTI 4, 1965, i53f.] This would be the very opposite of Brandon's thesis, with the Zealots filling the role of antichrist. But it does not explain the masculine singular (as a vaticinium ex eventu should require) and again it is too late for a pre-war flight, and perhaps for any. 'You have fared like the congregations in Judaea, God's people in Christ Jesus. You have been treated by your countrymen as they are treated by the Jews' (I Thess. 2.14). 'I tell you this: the present generation will live to see it all' (13.30). In fact there is, as we said, wide agreement among scholars that Mark 13 does fit better before the destruction of the temple it purports to prophesy. This is relevant as we turn now to Matthew and Luke. What will be significant are differences from Mark: otherwise the same presumption will continue to hold. The others seized the servants, attacked them brutally and killed them. The king was furious; he sent troops to kill those murderers and set their town on fire (22.6f.). is an addition, probably by the evangelist. The sole question is, When was it added and does it reflect in retrospect the destruction of Jerusalem (to which it must obviously allude)? It has to be admitted that this is the single verse in the New Testament that most looks like a retrospective prophecy of the events of 70, and it has almost universally been so taken. It is the only passage which mentions the destruction of Jerusalem by fire. Yet, as K. H. Rengstorfhas argued, [K. H. Rengstorf, 'Der Stadt der Morder (Mt 22.7)' in W. Eitester (ed. ), Judentum-Urchristentum-Kirche: Festschrift fur Joachim Jeremias (ZNW Beiheft 26), 1960, 106-29 (especially 125f.).] the wording of Matt. 22.7 represents a fixed description of ancient expeditions of punishment and is such an established topos of Near Eastern, Old Testament and rabbinic literature that it is precarious to infer that it must reflect a particular occurrence. He concludes that it has no relevance for the dating of the first gospel. And this conclusion is borne out in a further study by Sigfred Pedersen [S. Pedersen, 'Zum Problem der vaticinia ex eventu (eine Analyse von Mt 21.33-46 par; 22.1-10 par)',.ST19, 1965, 167-88. ], who believes that this and the preceding parable of the wicked husbandmen are fundamentally shaped by material from the Old Testament, especially Jeremiah. The most he will say is that if Matthew is writing after 70, then we must see this as a contributory occasion for the addition (which of course no one would deny). We have overthrown the wall of Zion and we have burnt the place of the mighty God (7.1). [I.e. the temple. For this sense, cf. II Mace. 5.17-20; John 11.48; Acts6.14; 21.28; etc.] They delivered ... to the enemy the overthrown wall, and plundered the house, and burnt the temple (80.3). He argues indeed that there is every reason to assume that the final redactor of the parable would have altered the reference if he had been writing after 70. This, I believe, is putting it too strongly, since undoubtedly Christians came to see the destruction of Jerusalem as God's retribution on Israel, whoever the human agent. [Cf. later (c. 300) Eusebius, HE 3.5.3: 'The justice of God then visited upon them [the Jews] all their acts of violence to Christ and his apostles, by destroying that generation of wicked persons root and branch from among men'; also (c. 400) Sulpicius Severus, Chron. 2.30. But evidence for this is remarkably absent from earlier writings where one might expect it, e.g. the Epistle of Barnabas orJustin's Dialogue with Trypho.] Yet the correspondence does not seem close enough to require composition in the light of the event. Nevertheless, the conclusion must, I think, stand that on the basis of Matt. 22.7 alone it is impossible to make a firm judgment. It could reflect 70. [R. V. G. Tasker, St Matthew (Tyndale NTC), 1961, 206, suggests that the verses may have been marginal comment (subsequently embodied in the text) added after 70 to draw attention to the judgment on Israel for persecuting the Christians. The weakness in this suggestion is of course the lack of any textual evidence.] On the other hand, it need not. One must decide on the evidence of the distinctive features in Matthew's apocalypse in chapter 24. The first observation to be made is how few these are. As K. Stendahl says, 'He does not have any more explicit references than Mark to the Jewish War or the withdrawing of the Christians from Jerusalem'. 1. In 24.3, the purpose of the discourse is broadened to answer the disciples not merely on the date of the destruction of the temple ('Tell us, when will this happen ?') but on the theme to which the chapter (and the one following) is really addressed: 'And what will be the signal for your coming and the end of the age?' It is significant, however, that the former question does not drop out, as might be expected (especially since Matthew has no more answer to it than Mark) if at the rime of writing it now related to the past whilst the parousia was still awaited. 2. In 24.9-14, the prophecies of persecutions ahead found in Mark 13.9-12 are omitted, being placed by Matthew in Jesus' mission charge to the disciples during the Galilean ministry (10.17-21). Whatever the motives for this, the effect is to see the predictions fulfilled earlier rather than later, and evidently they are not intended by Matthew to have any reference to the sufferings of the Jewish war. In their place Matthew has warnings against division and defection within the church, which are presumably relevant to the state of his own community but have no bearing on the question of date. They sat idly by when it [Jerusalem] was surrendered, when the holy place was given up to the alien (I Mace. 2.7). Yet none of Matthew's changes affects the sense or makes the application more specific (in fact the neuter participle does the opposite). Again he does not mention the reference in Daniel to the cessation of the daily sacrifices. If Matthew intended the reader to 'understand' in the prediction events lying by then in the past he has certainly given him no help. Moreover, as Zahn said long ago [INT,571. ], in view of Matthew's appeal to conditions in Jerusalem 'to this day' (27.8; cf. 28.15), one would have expected him of all people to draw attention to the present devastation of the site. Pray that it may not be winter when you have to make your escape, or Sabbath. 'When you have to make your escape' merely specifies what must be meant in Mark. The reference to the sabbath could again contain an allusion back to the fact that when the faithful of Judaea took to the hills after the original 'abomination of desolation' their first encounter with the enemy was on the sabbath and because of scruples which they later abandoned they were massacred without resistance (I Mace. 2.29-41). But it is more likely to refer to the obstacles to movement on the sabbath for Jewish Christians who were strict observers of the law. In any case it bespeaks a primitive Palestinian milieu and a community-discipline stricter than that recommended in Matthew's own church (cf. Matt. 12.1-14). It is certainly not an addition that argues for a situation after 70. Indeed it is one of those points of difference where, unless one is committed to over-all Markan priority, it looks as though Mark has omitted an element in the tradition no longer relevant for the Gentile church. 5. Matthew's material without parallel in the Markan tradition (24.26-8; 24.37-25.46) has no reference to the fall of Jerusalem but, like the additional signs of the parousia in 24.30f., solely to 'the consummation of the age'. Yet his version of the 'Q,' material in 24.26, 'If they tell you, "He is there in the wilderness", do not go out', clearly shows that in his mind the scene is still in Judaea (in the Lukan parallel in 17.23 it could be anywhere). It is significant therefore that in 24.29, 'the distress of those days' (i.e., on the assumption of ex eventu prophecy, the Judaean war) is to be followed 'immediately' (εὐθέως) by the coming of the Son of Man, whereas in Mark 13.24 it is promised vaguely 'in those days, after that distress'. Normally Matthew edits out (if this is the relationship between them) Mark's incessant use of εὐθύς. Never elsewhere does he alter a Markan phrase to εὐθέως. [Though he adds the word, without significant change of sense, in 27.48. B. W. Bacon, 'The Apocalyptic Chapter of the Synoptic Gospels', JBL 28, 1909, a, argued (without a shred of evidence) that εὐθύς could 'easily' have been in the original text of Mark 13.24 - though this would still not explain why Matthew retained it.] This makes it extraordinarily difficult to believe that Matthew could deliberately be writing for the interval between the Jewish war and the parousia. So conscious was Harnack [Chron., 653f.] of this difficulty that he insisted that the interval could not be extended more than five years (or ten at the very most), thus dating Matthew c. 70-5. He would rather believe that Matthew wrote before the fall of Jerusalem than stretch the meaning of εὐθέως further. It seems a curious exercise to stretch it at all! [E. J. Goodspeed, An Introduction to the New Testament, Chicago 1937, 176.] who put Luke at 90, said of Matthew, 'A book containing such a statement can hardly have been written very long after ad 70' (though his elastic was prepared to extend to 80). The only other way of taking this verse retrospectively is to say that 'the coming of the Son of Man', though not 'the consummation of the age', did occur with the fall of Jerusalem. [Cf. A. Feuillet, 'La synthese eschatologique de saint Matthieu', RB 55-6, 1949-50, 340-64, 62-91, 180-211 (especially 351-6); 'Le sens du mot parousie dans 'evangile de Matthieu' in W. D. Davies and D. Daube (edd. ), The Background of the New Testament and its Eschatology: In Honour of C. H. Dodd, Cambridge 1956, 261 – 80; Gaston, No Stone on Another, 484; also (somewhat differently) France, Jesus and the OT, 227-39; and G. B. Caird, Jesus and the Jewish Nation (Ethel M. Wood Lecture), 1965.] But it is a fairly desperate expedient to seek to distinguish these two (joined by Matthew by a single article in 24.3) in face of the usage of the rest of the New Testament. Finally, Matthew retains unaltered Jesus' solemn pronouncement, 'The present generation will live to see it all' (24.34), preserving also (as the equivalent of Mark 9.1) the saying, 'There are some standing here who will not taste of death before they have seen the Son of Man coming in his kingdom' (16.28). Most notoriously of all, he has, alongside the apocalyptic material from the Markan tradition which he sets in his mission charge, the promise, 'Before you have gone through all the towns of Israel the Son of Man will have come' (10.23). [This again could well be a saying which Mark has omitted from the common tradition as irrelevant to his Gentile readers.] If, on the usual reckoning, the evangelist is writing some 50-60 years after the death of Jesus, it is surely incredible that there are no traces of attempts to explain away or cover up such obviously by then unfulfillable predictions. One would equally expect modifications to prophecies after the non-event. Indeed, I think that it needs to be asked much more pressingly than it is why warnings and predictions relating to the crisis in Judaea should have been produced or reproduced in such profusion after the events to which they referred. Just as Jesus' parables were reapplied to the life of the church and to the parousia when their original setting in the crisis of his ministry was no longer relevant [Cf. C. H. Dodd, The Parables of the Kingdom, 1935, and J. Jeremias, The Parables of Jesus, ET 3I972. ], so one might suppose that instructions given, or pointed up, for earlier situations would, if remembered at all afterwards, have become related more timelessly to the End. Alternatively, if subsequent occasion required, they might have been brought out and subjected to recalculation (the way that Jeremiah's unfulfilled prediction of the seventy years' duration of the exile is reapplied 'on reflection' in Dan. 9.1-27). But the period of composition commonly assigned to both Matthew and Luke (80-90) was, as far as we know, marked by no crisis for the church that would reawaken the relevance of apocalyptic. [B. H. Streeter, The Four Gospels, 1924, 516-23, associated it with the rumours of the return of Nero redivivus. But there is no other evidence connecting this myth with the gospel tradition, even if we could date it with certainty (see pp. 245f. below). Moreover Streeter's argument depends on his omission (with the Sinaitic Syriac) of 'standing in the holy place' from Matt. 24.15.] I fail to see any motive for preserving, let alone inventing, prophecies long after the dust had settled in Judaea, unless it be to present Jesus as a prognosticator of uncanny accuracy (in which case the evangelists have defeated the exercise by including palpably unfulfilled predictions). It would seem much more likely, as the form critics have taught us to expect, that these sayings, like the rest, were adapted to the use of the church when and as they were relevant to its immediate needs. But the identification rests on a rather remote resemblance of names, and this Zacharias, not being a priest, would have been unlikely to have been 'between the sanctuary and the altar.' On Jesus' lips it makes entirely good sense to interpret the reference, with the Gospel according to the Hebrews [According to Jerome, in Matt. 23.35. ], as being to the murder of Zechariah son of Jehoiada the priest (II Chron. 24.20-2), whom Matthew, like some of the rabbis, has evidently confused with Zechariah son of Berechiah, the prophet (Zech.1.1). [So e.g. A. H. McNeile, St Matthew, 1915; J. M. Creed, St Luke, 1930; H. St J.Thackeray, Josephus, Loeb Classical Library, 1928, ad locc.] In any case it is far too uncertain a piece of evidence to carry any weight by itself. Finally, then, we turn to Luke. His parallel to the Markan apocalypse must be taken closely with another earlier passage relating to Jerusalem and it will be convenient to set them out together. When he came in sight of the city, he wept over it and said, 'If only you had known, on this great day, the way that leads to peace! But no; it is hidden from your sight. For a time will come upon you, when your enemies will set up siege-works against you; they will encircle you and hem you in at every point; they will bring you to the ground, you and your children within your walls, and not leave you one stone standing on another, because you did not recognize God's moment when it came' (19.41-4). But when you see Jerusalem encircled by armies, then you may be sure that her destruction is near. Then those who are in Judaea must take to the hills; those who are in the city itself must leave it, and those who are out in the country must not enter; because this is the time of retribution, when all that stands written is to be fulfilled. Alas for women who are with child in those days, or have children at the breast! For there will be great distress in the land and a terrible judgment upon this people. They will fall at the sword's point; they will be carried captive into all countries; and Jerusalem will be trampled down by foreigners until their day has run its course (21.20-4). The latter passage replaces, and at some points echoes, that in Mark 13.14-20 beginning, 'But when you see "the abomination of desolation" ...'. Its relation to it must be considered shortly. But first let us look at what Luke himself actually says. Yet this is far from indisputable. In an article written now thirty years ago but strangely neglected, Dodd argued strongly and circumstantially that no such inference could be drawn. These operations are no more than the regular commonplaces of ancient warfare. In Josephus's account of the Roman capture of Jerusalem there are some features which are more distinctive; such as the fantastic faction-fighting which continued all through the siege, the horrors of pestilence and famine (including cannibalism), and finally the conflagration in which the Temple and a large part of the city perished. It is these that caught the imagination of Josephus, and, we may suppose, of any other witness of these events. Nothing is said of them here. On the other hand, among all the barbarities which Josephus reports, he does not say that the conquerors dashed children to the ground. Dodd then proceeds to show in detail how all the language used by Luke or his source is drawn not from recent events but from a mind soaked in the Septuagint. [Though it is cited with approval by Pedersen, ST 19, 168. ], which independently reaches much the same position. But the absence of any clear reference to 70 does not settle the question of what Luke is doing in relation to the Markan material. Indeed on this Dodd and Reicke come to opposite conclusions. Reicke, with the majority of critics, thinks that Luke 21.20-4 is an editing of Mark: Dodd holds that it is independent tradition into which the evangelist has simply inserted verbatim two phrases from Mark: 'Then those who are in Judaea must take to the hills' (21.21 a) and 'Alas for women who are with child in those days, or who have children at the breast!' (21.23a). [In 21.20 the reference to the 'desolation' of Jerusalem derives, Dodd argues, not from Mark (and Daniel) but from the frequent use of the word in this context by Jeremiah.] The latter alternative seems to me the more probable [Cf. my Jesus and His Coming, 1957, 122-4. Similarly T. W. Manson, The Sayings of Jesus, 1949, 328-37; Taylor, Mark, 512; Gaston, op. cit., 358. ], if only because the introduction of 'Judaea' in 21.21a upsets the reference of ἐν μέσω αὐτῆς in 21b, which must be to Jerusalem αὐτῆςÂ 21.20). But, whether or not this was material which Luke had prior to his use of the Markan tradition, he has clearly now united the two. Is the effect of their combination to suggest or to require a later date? The last clause goes beyond the evidence, for Luke may not have known it. Nevertheless the point stands against a vaticinium ex eventu. Things did not in fact turn out like that. Indeed they could not, for there was no escaping once the city had been encircled. On that day the man who is on the roof and his belongings in the house must not come down to pick them up; he, too, who is in the fields must not go back. In Luke this is 'wars and insurrections' (ἀκαταστασίας) (21.9). The latter word appears here to have the same meaning as στἀσις, which is used by Luke (23.19, 25), as by Mark (15.7), of the Barabbas incident, and in the context (cf. Luke 21.8) seems to refer to risings led by messianic pretenders, such as he also records from the 40s and 50s in Acts (5.36f. ; 21.38). [στἀσις refers also, of course, to purely civil disturbances (Acts 19.40; 23.10; 24.5), as presumably do the ἀκατασταςίαι II Cor. 6.5.] There is no ground for assuming that he is alluding specifically to the Jewish revolt of 66-70, let alone writing after it. But before we can even consider that piece of bravado it is necessary to establish some sort of scale of measurement by which the progress of affairs in the Christian church 'about the middle of the century' can be assessed. And the best, indeed the only, way of discovering any fixed points is to turn to the evidence provided by the life and writings of Paul.